YOU ARE THE RED SQUARE, and you must shoot everything else. 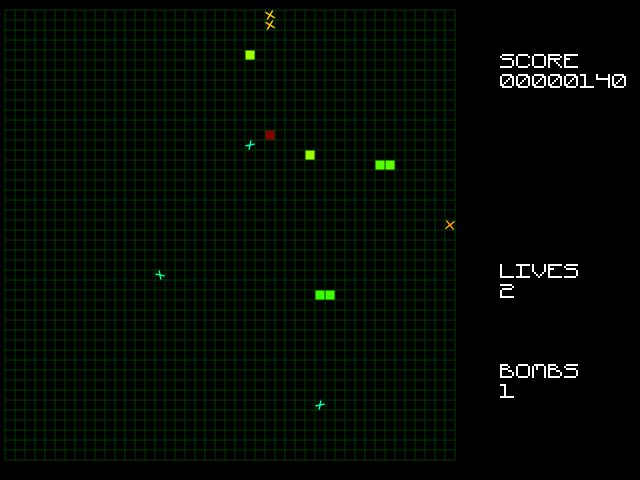 More points are scored the more enemies are on screen. WASD to move, cursor keys to fire, space to activate your smart bomb. Joystick, initially set up for (on my Logitech pad) left stick to move, right stick or right-hand diamond buttons to fire, plus button '6' as bomb. ESC to quit current game, or from title screen to exit the game totally. Any key, or joystick shoot-up, to start. I forget where exactly the music I nicked came from. One's a Turrican cover, that I know. Sound effects are from various C64 games. Uses SDL, OpenGL and FMOD for sound.